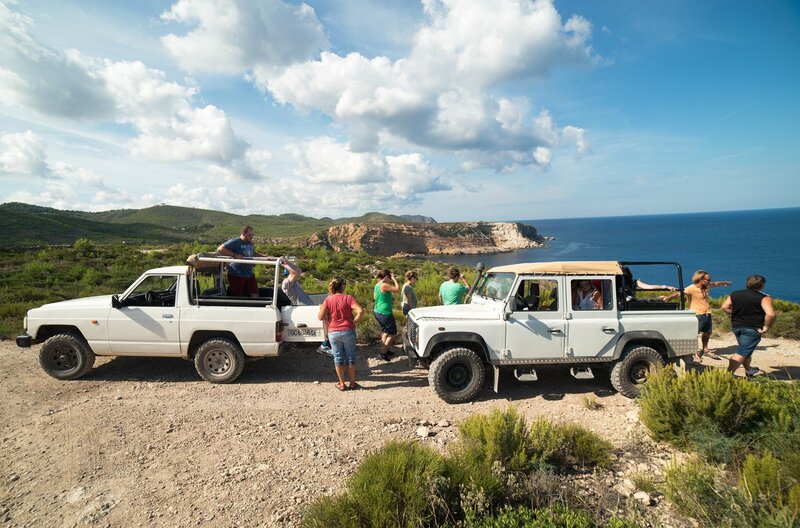 Explore the north, east and west of Ibiza on this guided safari tour that takes you through the rough terrain, past scenery only accessible in a jeep. Transfer service from and to your accommodation is available free of charge. If you think you've seen everything on Ibiza or want to discover the other side of the island, this tour is for you. A great and fun way of discovering Ibiza safari style. This amazing scenic tour of the island, down some of Ibiza's secret rough lanes, takes you to viewpoints and beaches you never dreamt existed. The Ibiza Jeep Safari team assures you are safe in their all-terrain jeeps. You'll be picked up from your accommodation between 9.30 and 10:00 h. During the tour the multilingual guides share stories and information about Ibiza's history, flora and fauna. There are stops to take in the beauty of the island, so bring your camera. There will be a break for lunch which is included in the price: either a baguette on the beach, or a meal at a popular local restaurant. Vegetarian option possible. After lunch the tour continues and allows time for a refreshing swim at one of the most beautiful beaches in the north. Bliss! You will be picked up from your accommodation or nearest landmark before heading out on safari and will be taken back at the end of the day. Lunch at a typical Ibizan restaurant is included (drinks extra). The price is 89 € for adults and 74 € for children aged 6-11. When? Every Tuesday, Thursday and Friday. The tour starts at 10 h and finishes around 16 h.
This tour also includes transfer to and from your accommodation or nearest landmark before heading out on safari, with a beach lunch stop, when filled baguettes will be offered. The price for the Small Tour is just 74 € for adults and 62 € for children aged 6-11. When: Every Monday, Wednesday and Saturday. The tour starts at 10 h and finishes around 14:30 h.
Office opening hours: every day from 10:00 to 18:00 h.
If you cancel more than 48 hours in advance of your chosen date, you will be fully refunded. In case of heavy rain, the activity can either be rescheduled or refunded.